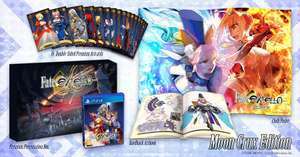 The ‘Moon Crux Edition’ contains a 7.5” by 6.3” hardcover art book featuring over 100 pages of high-quality artwork from Fate/EXTELLA: The Umbral Star, a pack of sixteen collectible 3” by 5” cards depicting each of the game's Servants, and a 24” by 17” cloth poster, all housed in a custom box. This is one of the more impressive PlayStation vita limited editions. I urge all vita enthusiasts to check it out! Also works with PlayStation TV. Is this version that they are selling in English or Japanese? Woah sweet, that's an excellent deal. Thanks OP, HEAT!